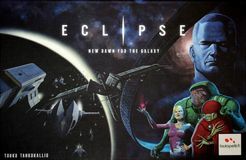 Buy Eclipse and PriceWatch, Buy this board game at the Lowest Price. Eclipse is a game that has everyone buzzing at the moment. It was released last year in 2011 and quickly sold out. The second print run that was released this past July has also sold through, with a third print run rumored for later this year. Eclipse is a space civilization game with a heavy focus on technological development. The game lasts nine rounds and the player with the most accumulated victory points wins. Minerals (Brown): Minerals is the resource needed to build space ships. The more you have, the bigger a fleet you can build! Research (Pink): Research allows you to purchase technology. Most of these technologies are ship improvements, though there are some that help you develop your economy as well. Money (Orange): At the end of each turn, you need to pay money based on the number of actions you took during the round. The more actions you take, the more you have to cough up when the round ends. Influence Discs: Influence discs are used to take actions and to gain control of space systems. As mentioned before, the more discs you commit to the game, the higher the money you need to pay at the end of the round. Space Fleet: There are four types of ships in the game: Interceptors (Small), Cruisers (Medium), Dreadnoughts (Large) and Starbases (Stationary defense). Your game board has blueprints for each of them. As the game develops, you use purchased technology to improve some or all of these ships in many different aspects (e.g. firepower, speed, defense, special weapons etc). During each round, players take turns choosing and resolving actions one at a time. Most actions require use of one or more influence discs (thereby invoking a cost to be paid at the end of the round). A player can also choose to pass and play no more actions (usually when they find that the associated cost is too prohibitive). After all players have passed, combat is resolved in any space system involving opposing fleets. Once all combat is done, the next round begins. Players can choose to explore a neighboring system. To do this they take a facedown tile at random and place it within the playing area. The system can either be friendly (and be conquered immediately) or hostile. Hostile systems consist of Ancient ships that must first be eradicated before the system can be conquered. Conquering systems gives a player a discovery tile: this can either be a free technology, extra resources, or the tile can be kept unused for 2VPs. In addition, any planets the system contains can be colonized, thus improving the harvesting of resources (Brown, Orange and Pink planets improve their associated commodity while white planets are wild cards). Influence allows players to move influence discs around the playing area in a manner that befits him (e.g. to conquer new systems or reduce payment costs by returning them to the supply). Research allows players to purchase a technology tile from those currently available on the game board. At the start of each round a fixed number of technology tiles are drawn at random from a cloth bag. If someone else picks up a tile before you can, then too bad! Each technology has a price (to be paid in Research resources), but discounts are available for purchasing technology within the same tree. Most economical technologies provide immediate benefits, but technologies associated with ships are not applied until the ships are Upgraded (see next paragraph). Upgrade: Upgrade allows a player to improve their ships if the player has already purchased the required technology. Up to two new ship parts can be added across the blueprints of the entire fleet. For example, if a player purchased the Plasma Missile technology (using a Research action), he can then use an Upgrade action to place two Plasma Missiles tiles on one or more of his ship's blueprints. All corresponding ships in the playing area immediately receive the benefits of upgrades applied to their blueprint. Build: Players can build up to two spaceships by paying the mineral resources required for those ships: Interceptors and Starbases cost 3, Cruisers cost 5, and Dreadnoughts cost 7. Other advanced structures can also be built at this time, but requires the technology to be purchased first. Move: Players can move up to three ships equal to the speed noted on their blueprint. At the end of the action phase when all players have passed, any systems containing two different factions (players and Ancient ships) engage in combat. When two sides engage in combat, ships fire in initiative order (Found where? Correct: the blueprints!). As a general rule, smaller ships tend to fire first with all ties being resolved in favour of the defender (whoever is in control of the current system). As a default, ships fire by rolling a D6 and hitting on a 6. As you can expect, different technologies can improve the hit chance (either offensively or defensively), the amount of damage dealt and the amount of hit points a ship can take before being destroyed. The combat ends when one side retreats or is annihilated. For each side, a number of victory tiles are drawn at random from a cloth bag. The player keeps one and returns the rest back to the bag. The winner draws substantially more, thus increasing the chance of obtaining a high value VP tile. The best game you can compare Eclipse to is Twilight Imperium 3rd Edition. Both are space civilization based games with a focus on technology, space exploration, territory control with a splash of politics and diplomacy. TI3 (As Twilight Imperium 3rd Edition is affectionately known) puts a lot of details into the many different mechanics of the game, which allows players to specialise in specific strategies from the offset (usually coupled with advantages from the player's chosen race). In Eclipse, the actions are more simplified. Taking into account starting races, luck on exploration and the randomized technology that occur through the game, these actions are often tactical in nature, with long term strategies being developed on-the-fly, so to speak. The exploration tiles, aka the tiles you flip as you explore space, have a heavy influence in how you develop your path to victory. Sometimes you get a nice selection of planets to colonize from the offset and perhaps some lucky technological discovery. At other times, you find your neighbors all being Ancient Ships, cursing your luck as your opponent enjoys not being hassled by these space pirates. Developing your economy has a similar feel to Through the Ages: A Story of Civilization (another popular civilization game), there are a lot of little cubes to move about and, as a general rule, the more you have on the playing area, the more advanced your economy is. However, as mentioned above, committing too many influence discs means not being able to pay your way at the end of the round. To resolve this you need to remove discs from the playing area, putting them back on your game board. More often than not this means losing control of space systems and planets (and resources) associated with them. Overextending in this game can lead to the death of your economy and an early exit out of the game. Then there are your opponents: the game encourages friendly relations by offering you an economic bonus when you first encounter each other in space. However these are lost as soon as you are in conflict with each other. Remember that no space system can be occupied by two factions, meaning that once battle lines are drawn, someone will inevitably make a grab for more territory. Technology often makes the different between a stalemate (where opposing factions feel equally balanced) or a massacre (when one side is clearly outclassed). Hint: don't be the underling and ensure you pick up enough technology to defend your territory! Eclipse gives a lot of depth for a game for the amount of time it takes to play. The choices in technology and starting race along with unexplored space makes for a highly replayable game, one where you can certainly get a feel for developing your own personal strategy towards the game across multiple replays. It's difficult to find fault with a game that has been very well developed and is in great demand after selling through two sets of print runs. Whether it will take over TI3 as *the* space civilisation game though, only time will tell, but Eclipse stands out as one of the great games in recent years.